"Helzberg Diamonds is committed to providing customers with jewelry options to best fit their styles and tastes - whether traditional mined diamonds or lab-grown diamonds," a company spokesperson said. "We continue to evaluate consumer response to our lab-created-diamond offerings." Helzberg has been stocking other brands’ synthetic-diamond jewelry since late 2017, including bridal and other jewelry from ALTR Created Diamonds. The company is the eighth-largest jewelry retailer in the US by revenue, according to National Jeweler’s "State of the Majors" report for 2018. It operates 210 stores throughout the country. Gem quality synthetic diamonds are more available in today’s jewelry marketplace than ever before, causing both interest and concern among jewelers about the material’s nature and whether it can be identified by gemologists or gemological labs. Gemological Institute of America has studied synthetic or "man-made" diamonds extensively over the past 30 years, and GIA knows a great deal about how they are produced and can be recognized. While synthetic diamonds are lab-grown or factory produced, their chemical and physical properties correspond very closely to those of natural diamonds. Some people might refer to synthetic diamonds as imitations or simulants, but this is incorrect. Imitations like cubic zirconia or synthetic moissanite, which only look like diamond, have very different chemical and physical properties. This allows trained gemologists to recognize them readily. However, synthetic diamonds are much harder to detect. In some cases a trained gemologist can recognize these synthetic and treated diamonds by using standard gem-testing equipment. In other instances, positive identification must involve testing the diamond using advanced scientific instruments at the GIA laboratory. At GIA, they have created a large database of information on the gemological properties of diamonds of all kinds, which can be used to help develop additional means of diamond identification. New York--Consumer spending on ’Cyber Monday’ reached a record $1.47 billion, with jewelry and watches ranking among the top five categories posting the strongest year-over-year growth, data released Wednesday by comScore shows. Spending on the category defined as Jewelry & Watches by comScore grew 17 percent year-over-year. The fastest-growing category was Digital Content & Subscriptions, with spending up 28 percent, followed by Consumer Electronics (up 24 percent), Computer Hardware (up 22 percent) and Video Games, Consoles & Accessories (up 17 percent). Overall, the $1.47 billion spent online on Monday represents a 17 percent increase over 2011 and sets a new record for spending online in a single day. ComScore, a digital metrics firm, had forecasted that Cyber Monday spending would reach or exceed $1.5 billion, topping the record $1 billion spent online on Black Friday. In a news release, comScore Chairman Gian Fulgoni said the record spending flies in the face of news reports that stated that Cyber Monday, the marketing term applied to the Monday after Thanksgiving that has become a boon for holiday deals and shopping online, is declining in importance. ’However, it is also clear that the holiday promotional period has begun even earlier this year, with strong online sales occurring on Thanksgiving Day and Black Friday. Now, we shall see the extent to which continuing and attractive retailer promotions are able to boost sales for the remainder of the week,’ he said. Prior to the release of the comScore data on Wednesday, IBM’s Smarter Commerce Arm, which analyzes data from 500 retailers nationwide, published its own data showing that online sales increased 30 percent on Cyber Monday. IBM stated that while consumers spent more on Cyber Monday (IBM did not provide specific dollar figures) they also shopped with greater frequency to take advantage of discounts and free shipping, leading the average order value to decline 7 percent to $185.12. Though sales were up year-over-year on Cyber Monday, the IBM data shows that social media did not play a big role in the increase. Shoppers referred from sites such as Facebook, LinkedIn, Twitter and YouTube generated less than 1 percent of all online sales on Cyber Monday, a decrease of more than 26 percent from 2011. The peak shopping time of the day was 11:25 a.m. EST, with shopping also maintaining momentum after commuting hours on the East and West coasts. In addition, data from both IBM and ChannelAdvisor, a company that provides consulting and software for retailers that sell online, shows that consumers are getting more comfortable shopping from their smartphones and tablet computers. According to ChannelAdvisor, in 2011, about 87 percent of consumers who shopped on Cyber Monday did so from their computers while only 13 percent used a smartphone or tablet. This year, mobile usage on Cyber Monday increased to 25 percent among shoppers, with usage split equally between tablet computers (13 percent) and smartphones (12 percent). IBM’s data states that on Cyber Monday, more than 18 percent of consumers used a mobile device to visit a retailer’s site, an increase of more than 70 percent over last year. Mobile sales accounted for about 13 percent of total sales that day, up more than 96 percent over 2011. The iPad generated more traffic than any other tablet or smartphone, driving more than 7 percent of online shopping, followed closely by the iPhone at slightly less than 7 percent and Android devices at 5 percent. The iPad also was the overwhelming traffic-driver among tablets at 91 percent, followed by the Amazon Kindle at 3 percent, the Samsung Galaxy at 2 percent and the Barnes & Noble Nook at less than 1 percent. RAPAPORT… U.S. consumer confidence rose 11 percent year on year in July to 65.9 points (1985=100), according to The Conference Board. The Expectations Index rose five points to 79.1 and The Present Situation Index increase nearly 10 points to 46.2. Lynn Franco, the director of economic indicators at The Conference Board, explained that readings in July were slightly better than those taken in June. Nonetheless, all three indexes remain at ’historically low levels,’ she concluded. ’Consumers’ attitude regarding current conditions was little changed in July, but their short-term expectations, which had declined last month, bounced back. However, while consumers expressed greater optimism about short-term business and employment prospects, they have grown more pessimistic about their earnings. Given the current economic environment - in particular the weak labor market - consumer confidence is not likely to gain any significant momentum in the coming months,’ Franco said. Nearly 14 percent of consumers claimed that business conditions were ’good’ in July, however, 34 percent found that conditions were ’bad.’ About four in 10 believed that jobs were ’hard to get,’ while only eight in 100 felt that jobs were ’plentiful’ in July. For years we have been looking at this chart. I believe De Beers first created it some years ago, and its former CEO Gareth Penny, used it in most of his famous PowerPoint presentations. Consider it the Pep Chart, because it is used to instill optimism. It’s the polished demand versus rough supply chart that shows that in the near future, rough supply will fall short of demand. Have we just reached that inflection point? DeBeers was not alone, Rio Tinto and Alrosa have their own versions of this graph. The premise is simple: With rough supplies dwindling and consumer demand expected to grow, at some point demand will exceed production. In the coming weeks De Beers and the rest of the major producers will issue production figures for the first half of 2011. In the first half of the year, global rough diamond production will total approximately 60 million carats, with De Beers and Alrosa providing nearly two-thirds of this. The sudden surge in polished diamond demand surprised many in the industry, including the producers. Naturally, diamond prices surged upwards as a result of this demand. It is very possible that we have crossed the Rubicon. The large gains in the polished prices are (at least partially) the markets’ response to shortages in rough diamonds. While polished prices are easing a little in the last few days, this is possibly a summer lull or a brief recoil in response to the speed and velocity of the surge before prices resume their advance. Consider the following price graph. We see the pre-crisis price bubble (not the industry’s fault as the world stock and real estate markets also ran wild at the same time), popping above the price trend in mid-2008. Another such spike is taking place now. The reason Penny showed the demand-is-about-to-outstrip-supply slide was to show that things would get much better in the future. The understanding was, prices of polished will run higher and subsequently allow margins to grow. Ramat-Gan - Prices of polished diamonds increased dramatically in February, rising 1.5 percent compared to January and 8.5 percent year-over-year, according to the IDEX Online Polished Diamond Price Index. The rise brought average prices to 4 percent short of their record level in August 2008. Emphasizing a mixture of optimism and retailers willingness to yield to wholesalers’ pressure, the average price increased by about 2.9 percent between February 1 and February 28, the sharpest price increase since the recovery cycle began nearly a year ago. At the end of February, the IDEX Online Polished Price Index stood at 124.5. The Index peaked at a record 128.9 during August 2008, just as the global economy was about to drop into a major recession. Several factors drove the price increases: Continued pressure by manufacturers to increase polished prices to maintain their margins have finally succeeded; a need to finally renew inventories after the decent holiday season; growth in emerging markets--mostly China; continually rising rough diamond prices; and the upcoming Hong Kong trade show, for which expectations are high. Prices of 1-carat, 4-carat and 5-carat goods rose on average more than 2 percent in February compared to January. Year-Over-year, 3-carat goods climbed the most, 24 percent on average. Other large items were not lagging far behind, with prices of five-caraters growing 16 percent, four-caraters adding 14 percent to their price and 1-carat goods increasing by 10 percent. Purchase, N.Y.â€”Jewelry sales enjoyed solid growth despite a â€œmild startâ€ this holiday season, rising 8.4 percent, MasterCard Advisors’ latest SpendingPulse report shows.The report, a macroeconomic survey of national retail and services based on sales activity in the MasterCard network, tracked spending between Nov. 5 and Dec. 24. Overall, the data showed season-over-season holiday sales growth of 5.5 percent ex-auto, as consumer spending continued to recover from the downturn. The report also notes that the holiday season started earlier this year, with consumers out and spending as early as the second week of November.â€œIf last year’s holiday story was about gaining some stability, this year’s is about getting back to growth,â€ Michael McNamara, vice president of research and analysis for SpendingPulse, said. â€œThe 2010 holiday period is categorized by strong year-over-year growth in apparel and continued strength in e-commerce. We also saw a noticeable return in spending in larger ticket items, as exemplified by the solid growth in jewelry, luxury and even the furniture category.â€Online sales continued to post robust growth, with seasonal sales up 15.4 percent. In product categories, apparel was a big winner, rising 11.2 percent overall. Menswear recorded sales growth of 10.5 percent year over year, while women’s apparel grew by 5.6 percent.Luxury excluding jewelry also grew during the holiday season, ending the season with sales up 6.7 percent. The lagging performer for the holiday season was electronics, according to SpendingPulse. Sales grew only 1.2 percent season over season in this category, a performance that could be attributed to the decline in television prices. The GIA (Gemological Institute of America) will have an Open House for its annual Jewelry Career Fair on October 16 at the Institute’s headquarters in Carlsbad, California. A yearly opportunity to visit GIA and its Museum without an appointment. The GIA Jewelry Career Fair is a free event from 8 am to 2:30 pm on October 16, Friday. On display will be the "Shibuki" necklace which means "splash" in Japanese, recently seen at this year’s Emmy Awards by an actress from Beverly Hills 90210. It is made up of 5.52 carats of diamonds set in 158 grams of platinum and is one of the 4 featured "Aqua Collection". Over 130 pieces will be showcased in the GIA Museum, including trilliant-cut gems from 7 to 81 carats, gem crystals such as tanzanite, emerald and aquamarine, jewelry by Fulco Verdura and Pierre SterlÃ© and Larissa Podgoretz, equipment and books. De Beers launched new idea called "Everlon"
DeBeers and Diamond Trading Co. (sightholders) have divulged their latestdiamond concept called "Everlon Diamond Knot Collection", aimed toimpact the 2009 holiday sales. The Everlon Diamond Knot is basedon the Hercules knot which is an ancient symbol of strength and securedby a diamond at the center. The knot along with the strongest mineralknown to man, is a symbol of the lasting strength of a couple’s love. Accordingto recent survey by De Beers on American consumers, 61% of females and58% of males expressed interest in the Everlon jewelry. 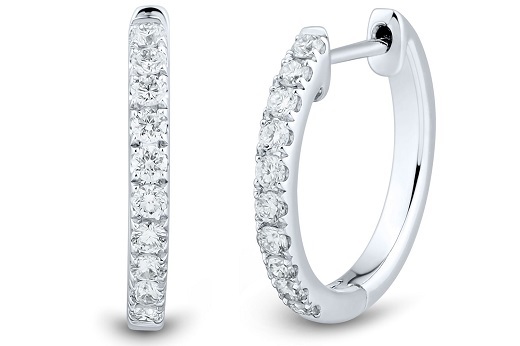 The resultsexceeded the benchmarks set by past best-selling diamond jewelryconcepts such as the "Three Stone" (past, preset and future) and the"Journey". Diamonds are furthermost the best gift of love despite therecession. According to the research conducted in June 2009, 7 of 10women think that the diamond jewelry is the most romantic gift a mancan give a woman. The Everlon campaign will run on TVcommercials starting on November, print advertising starting this monthof September including online and public relations support, drivingconsumers to ADiamondIsForever.com. New York - casting director Sean De Simone recently told National Jeweler that he is casting a new reality TV show of real-life couples going through the entire process of purchasing an engagement ring from choosing the right ring up to proposing. De Simone is looking for a jewelry store with peculiar employees similar to Kleinfeld Bridal in TLC’s "Say Yes to the Dress", who follow brides to be seeking their bridal gown. He is currently working with a production company that would shoulder the expenses and looking for a "family-owned" jewelry store, which would be the key factor, according Sean. The show could possibly be shown on TLC, WE or Oxygen at 6 to 8 episodes to start. Interested retailers are encouraged to contact Sean De Simone. If you are in the market to buy a diamond, now may be the best time to make that investment. Economists and diamond wholesalers are saying diamonds are among the best things to buy while the economy is in a recession. Televisions, laptops, women’s clothing, furniture and toys also made the list. Prices on large polished diamonds are lower today, dropping at least 5% to 8% on average in the last 18 months, while smaller stones ranging Â½ (half) carat to 2 carats have dropped about 3% to 5%. Diamond wholesalers have stated the diamond industry has never seen such a significant decrease in prices since the wholesale Price List (Rapaport) was released in 1970s. So if you are ready to pop the question, don’t let the economy discourage you because these prices will not last long. On november 12 in U.S. District Court for the Southern District of New York, Yehuda Diamonds filed a lawsuit against Blue Nile, an online retailer of loose diamonds and fine jewelry based in Seattle, on behalf of unspecified customers who purchased emeralds or emerald jewelry from the retailer. The lawsuit claims Blue Nile violated FTC guidelines by failing to disclose to consumers the emeralds or emerald jewelry sold on their website, Bluenile.com was artificially treated with an oil (wax , resin or other material) filling to enhance their appearance. The claim states the such treatment requires special care and without it can cause the emerald to fade over time and make them less valuable. Blue Nile is accused of "false advertising" and "unfair and deceptive business practices". Although Blue Nile has since updated their website to show the gemstones are treated with oil, Yehuda Diamonds is requesting the court force Blue Nile to offer refunds to customers who made purchases of gemstones on their website before the information was posted. A U.S. District Court has approved the notice and claims process for the De Beers settlement, and forms to make a claim under the class action lawsuit will be published on December 21. However, the Court will hold a hearing only in mid-April 2008 to determine whether the settlement should receive final approval. If it is approved, U.S. consumers and "reseller" members of the trade, who make up the majority of the settlement, will have until May 19, 2008 to file their claims. The claim filing, which will cover gem-quality diamonds only, will be promoted by a trade magazine ad campaign starting in January, following a mailed notice to some 50,000 members of the trade by the end of December. Notice to consumers about the De Beers settlement will start to appear in newspapers, magazines and online just before Christmas. The goal is to reach the maximum number of consumers who might wish to file a claim. Because the claims process will require consumers to itemize the amount of their purchases of diamond jewelry, it is likely that consumers could ask retailers to research the purchase price of any diamond or diamond jewelry they obtained at their stores between January 1, 1994 and March 31, 2006, Jewelers of America (JA) said. While the claims period for jewelers is also January 1, 1994 to March 31, 2006, the trade’s claims form will ask jewelers to pick any two-year period during those years, and to submit the total costs of the diamonds and diamond jewelry they purchased for resale during that time. The claims administrator will use that figure to compute each jeweler’s share of the $137 million settlement. Not all of the $137 million will be split among the trade and consumers. Attorneys can claim up to 25 percent of the total settlement for their fees, and some more to cover a portion of their expenses. The payouts will take place in late 2008 or early 2009, to allow time for the claims administrators to assess all claims and apportion the funds among the claimants, according to court papers. JA and the Jewelers Vigilance Committee’s (JVC) will provide forms and instructions on how to file the claims. No stranger to looking glamorous on the red carpet, Hollywood icon Angelina Jolie once again was simply stunning as she attended the New York premiere of The Assassination of Jesse James by the Coward Robert Ford.Taking place in Manhattan earlier this week, Jolie was certain to have wowed onlookers as she showed some resplendent Neil Lane platinum jewelry.Wearing a pair of dazzling platinum earrings, in addition to an eye-catching platinum cocktail ring, the smoldering star of blockbusters such as Tomb Raider and Mr & Mrs Smith is bound to have had all heads turned in her direction.And Jolie was sure to be at the premiere in support of partner Brad Pitt, who plays infamous cowboy Jesse James in the Western drama. The movie, which also stars Casey Affleck, Sam Rockwell and Zooey Deschanel, follows the outlaw as he and his gang discover they have a traitor in their midsts. Meanwhile, Jolie has been busy herself, starring in thriller A Mighty Heart which has just been released. Tracey Edmonds, the fiancee of Hollywood veteran Eddie Murphy, has announced the couple are looking to get married abroad. The movie producer told Sister 2 Sister magazine that the pair want an "intimate ceremony", in a "romantic, secluded spot outside the United States". She claimed: "I was speechless for a moment when I first saw it [the platinum ring]," before adding she has no idea how much money her husband-to-be spent on the dazzling ring. DiamondonNet has achieved highest ranking In loose diamond industry (number ONE) under the keywords "Buy Wholesale Diamonds" on the Yahoo search engine and ranks second on Google. Over 500 Happy customers that has left there great experience feedbacks and posted there best wishes of success. DiamondonNet attributes their success to personalized customer serviceand the company’s ability to offer competitive prices by cutting outthe middle man in the diamond buying process. This is the time to find an alternative that makes sense for mostcustomers, the points we can make about palladium are that it is anenvironmentally friendly, or "green," metal, it is 95 percent pure,making it safe for customers who might have allergic reactions to whitegold, and it is naturally white and bright. *It isn’t treated to achieve its color like other metals. *It is the "poor man’s platinum," to which we are pointing outits value and lower price relative to other metals, and that it is just a trend. Mostjewelers are not ready for the objections, concerning palladium yet butthere studies about this new trend will open new doors to introducetotally deferent jewelry lines. Thehistory of palladium begins with the history of platinum and theplatinum group metals of which palladium is a member. Traces ofplatinum have been found among artifacts from ancient Egypt, dated tothe seventh century B.C. and from Thebes, where craftsmen most likelymistaking it for silver, hammered and formed it in much the same manner. Centuriesbefore the arrival of the Spanish in the Americas, the Esmeraldas ofthe coastal region of Northern Ecuador fashioned small pieces ofjewelry, rings and pendants of platinum or platinum and gold combined,which displayed significant and sophisticated metallurgical skill.Following a comprehensive study involving independent consultants andthe Palladium Alliance International, under the auspices of theInternational Platinum Group Metals Association, a decision has beentaken to plan and implement a market development programme forpalladium jewelry. The initiative will initially focus on China and theUnited States of America. Norilsk Nickel, the largest producer ofpalladium, will lead, supported by the major palladium producers inSouth Africa (Anglo Platinum, Impala Platinum, and Lonmin) and theUnited States of America (Stillwater Mining Company).